If it still was not, Bilbao will be consecrated as the epicenter of world gastronomy in June next year. For those who do not know yet, our city will host the prestigious gastronomic awards The world’s 50 Best Restaurants in 2018. Although it had always been in London, in 2016 the gala was held in New York and recently has just taken place the last edition in Melbourne (Australia). There have been awarded prizes such as the best female chef, Ana Roš, from the restaurant Hiša Franko (Kobarid-Slovenia); to the best pastry cook, Dominique Ansel, from Dominique Ansel Bakery cafe-shops (with shops in New York, Tokyo and London); to the sustainable restaurant of the year, Septime in Paris (France); or to the chef Heston Blumenthal for his cutting-edge creations and techniques. And of course the new list has been released. At present, the first place stands the restaurant Eleven Madison Park of New York (United States), run by Daniel Humm. The Osteria Francescana of Modena (Italy), by Massimo Bottura, is second, and the Celler of Can Roca (Girona-Spain) of Roca brothers, the third. And of course, among those first 50 places are four Basque restaurants. The Asador Etxebarri, in Axpe (Bizkaia) and run by Víctor Arguinzoniz is in the number 6. Mugaritz, in Rentería (Gipuzkoa) with Andoni Luis Aduriz at the head, the 9th. Arzak, in San Sebastián (Gipuzkoa) with Juan Mari and Elena Arzak as conductors, occupies the thirtieth place. And finally, Azurmendi, in Larrabetzu (Bizkaia), of Eneko Atxa, the thirty-eighth. 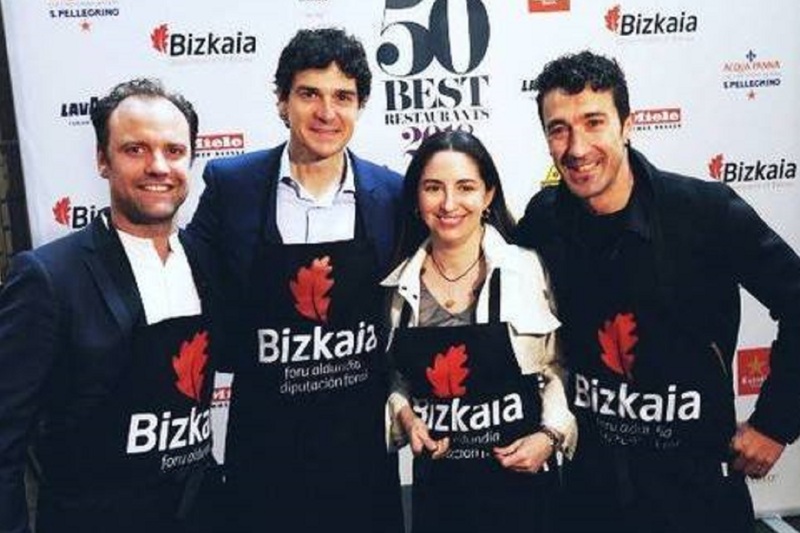 Nerua in Bilbao (Bizkaia) and Martín Berasategui in Lasarte-Oria (Gipuzkoa) are part of the rest of the list until reaching 100, placing our region in a prominent place in the gastronomic culture at international level. And next year’s gala, which will also feature side events in San Sebastian, will only reinforce our position in the culinary world.